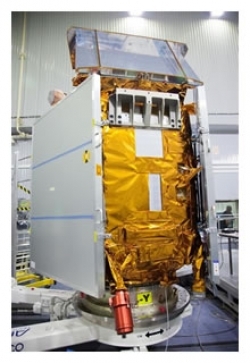 The European Space Agency’s latest satellite, Sentinel-5P, which will monitor the atmosphere for trace gases, has been shipped to its launch site in Plesetsk, Russia, and is set to launch during October. Sentinel-5 Precursor (S-5P) is the first Copernicus mission dedicated to monitoring the atmosphere and follows five other Sentinel satellites already in orbit. The Sentinel satellites make up the core of the European Union’s (EU) Copernicus environmental monitoring network. Copernicus provides information on the world’s land surfaces, oceans and atmosphere to support policy making and for citizens and service providers. (Tropomi), which will map a multitude of trace gases such as nitrogen dioxide, ozone, formaldehyde, sulphur dioxide, methane, carbon monoxide and aerosols – all of which can affect health and climate. With a swath width of 2600km, Tropomi will map the entire planet every day. Information from this new mission will be used through the Copernicus Atmosphere Monitoring Service for air quality forecasts and for decision making. The satellite is expected to be transported into orbit on a Rockot launcher on October 13, 2017. William Simpson, ESA’s Sentinel-5P satellite and launch manager, said, “It was great to see it arrive here in Plesetsk where the team was ready and waiting, keen to make sure the satellite was in good health after its voyage from the UK. “The launch campaign has got off to a flying start. We first unpacked all the electrical and mechanical support equipment, which is essential for testing the satellite, and then we used a crane to remove Sentinel-5P gently from its container. “Once we had it in position, one of the first jobs was to switch it on. This is always a tense moment, so there were smiles and cheers all round when the satellite clicked on, showing that all was well. “We’re now running though the list of checks, both for the satellite and for its Tropomi instrument, and the propulsion team is preparing to fuel the satellite before it joins the upper stage of its rocket and is encapsulated in the protective rocket fairing.